Duquesne Day of Giving 2019 has ended! 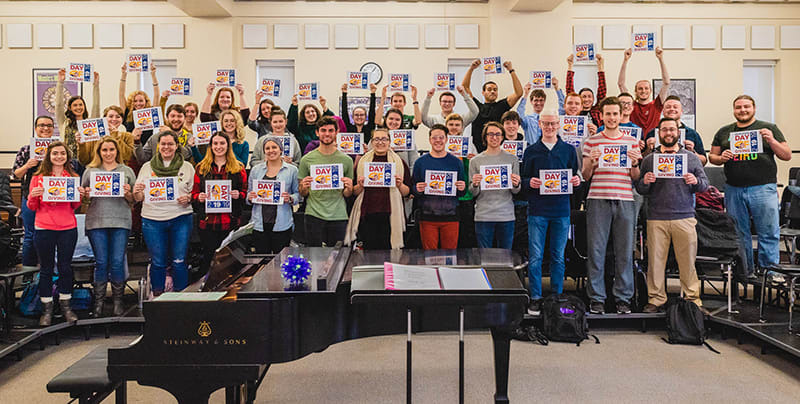 School of Music has raised $ 9,602 from 63 gifts! Here at the Mary Pappert School of Music, we help students become the musicians they want to be with degrees and programs backed by the skills and experiences of our world-class faculty. Our students benefit from state-of-the-art music technology and recording studios, 68 Steinway pianos, and two performance venues, among many other facilities. Your gift helps us to provide our students an education that utilizes all of these resources to their fullest potential. Access to professional performance facilities including Heinz Hall, Carnegie Music Hall, Twentieth Century Club, August Wilson Center, etc. Maintenance and upgrades to facilities, enabling our students to have access to the best learning environment available. Dean’s Discretionary Fund: Your gift to the Dean’s Discretionary Fund allows for us to use support our areas of greatest need. These needs can be anything from facility upgrades to student travel and anywhere in between. Duquesne University Choirs: Duquesne University is home to a three-choir program, led by Director of Choral Activities, Dr. Caron Daley. The choirs regularly present concerts and outreach performances around Pittsburgh and the region, including 2017–18 appearances at Trinity Cathedral, St. Bernard Church, Pittsburgh Creative and Performing Arts School, North Hills High School, Little Sisters of the Poor, Westminster Presbyterian Church (Buffalo, NY), and St. Peter Cathedral (Erie, PA). This spring, the Voices of Spirit will perform in Cleveland, OH. Your gifts to our choirs help to offset the costs associated with travel and lodging. See what people are sharing about Duquesne Day of Giving 2019! If 300 current parents of a Duquesne University student make a gift of any amount, to any area of the University, an anonymous Parents' Leadership Council family will make a $5,000 gift. Last year, alumni and friends generously donated $5,300 to the School of Music on the Day of Giving. This year, if the School of Music receives $6,000 in donations, it will unlock a $2,500 gift from Dean Seth Beckman. Jackie Harvey, M'56 will donate $1,000 if 50 individuals make a gift to the School of Music.